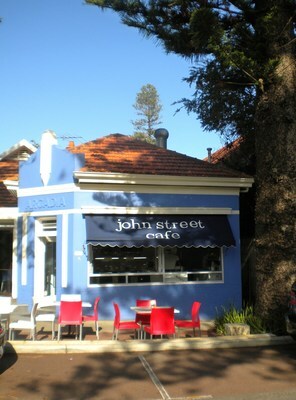 Upon learning I was now writing about fun and interesting things to do in Perth, my friend told me she "just had to" take me to John Street Café in Cottesloe. After hearing great things about it I have to admit I was expecting a bit more than a little, blue, café situated halfway up John St, away from the main coffee strip that overlooks Cottesloe beach. However, its location (despite the lack of ocean views) is what makes it endearing. Tucked away between residential housing, with those classic Cottesloe pines lining the street, it really does look like you've stumbled upon the local's secret café. Of course, these days, this isn't the case. John Street Café is becoming increasingly popular – great for the owners, not so great for the customer trying to get a table on a Sunday morning during the summer. Luckily I was able to head there on a Thursday during winter, so we only had to share the place with two other diners. Retro red and white plastic chairs surround the tables, while the tabletops themselves are painted by local Perth artist Jos Myers. It's hard to go past something from the breakfast menu, especially when it's served all day (extra bonus points right there), with a selection of egg dishes as well as smoked salmon, croissants and plenty of extras to add as you see fit. After giving me an odd stare, the waiter was even kind enough to let me order eggs benedict with scrambled eggs, instead of the usual poached. Upon returning with our food in a timely manner, that same waiter told me he was about to have his breakfast and had, in fact, asked for the same thing. So, if you see scrambled eggs benedict added to the menu next time you're there, I'd like to think I had something to do with that. The eggs were cooked perfectly and very filling, though the food may be a little pricey for what it is - $4 for a hash brown seems a tad indulgent, but then again I'm not a big fan of hash browns, so it might just be me. Of course, the biggest downside to this café is the lack of a permanent pancakes option. You just have to be lucky enough to be there on a day when the pancakes are on the specials board if you want to sample them. I still don't quite understand what all the fuss was about, so perhaps it's best not to go after someone has been talking it up to you, but it is a charming little café and the food certainly hit the spot. It was once amazing. The food really tasty & fresh, with a menu just slightly better than most breakfast options around. But that was 10 years ago & after my last visit late last year, it feels like they've gotten lazy. Food came out so quick it felt like fast food in taste & quality. Fingers crosses something changes, coz its a lovely little spot!